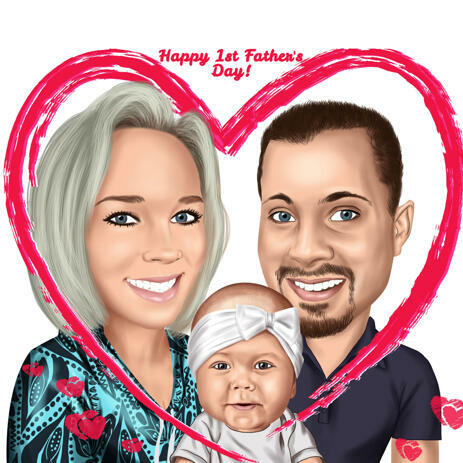 Get a custom First Father's Day caricature gift featuring your child and family, created in colored digital style. Commission our artist to draw fantastically a caricature from photo in honor of Father's Day or Birthday. Our professional artist will design such a caricature for your family, which will preserve your warm family relationships and evoke a love from any family member. We guarantee you a bright and funny caricature, which will make the best personalized gift for dad or grandfather. Mention your ideas in the requirements box below and our photolamus digital artist will execute a caricature within selected number of days after payment. Father's Day Caricature will be delivered as a high resolution JPG File to your Email. Additional suitable deliveries: Digital Daddy Caricature printed on Canvas or Photo Paper of desired size. Worldwide shipping is available for everyone who wishes.